Tutelo Lodge 161, Order of the Arrow | Tutelo ROCKS NOAC 2018 @ Indiana University! Tutelo ROCKS NOAC 2018 @ Indiana University! Tutelo’s NOAC contingent gathered in front of the Simon Skjodt Assembly Hall at Indiana University for this quick group photo. 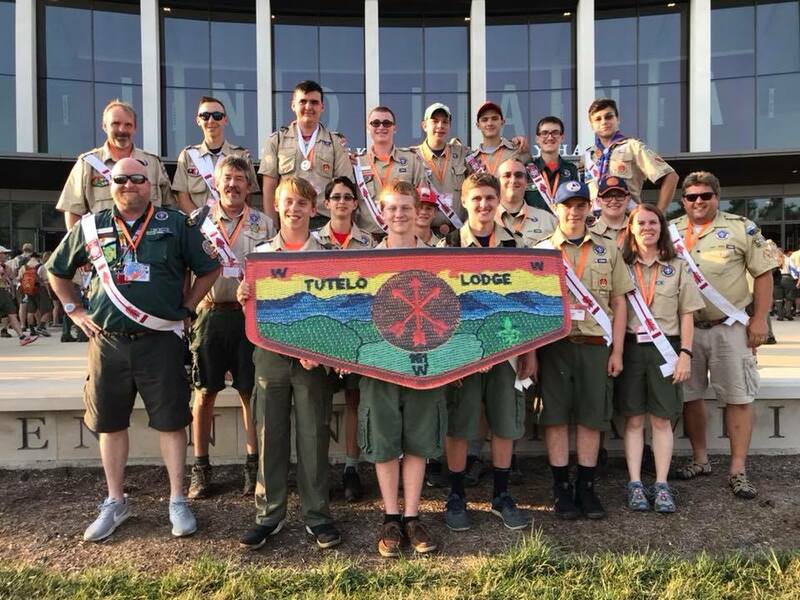 This summer, Tutelo Lodge loaded up vans, cars, trucks, and pack mules to travel over five hundred miles to Indiana University at Bloomington for the National Order of the Arrow Conference (NOAC). A delegation of twenty Tutelo participants and eight staffers from Tutelo joined almost 7,000 Arrowmen from across the country and beyond for this incredible experience. There was something at NOAC for everyone, including training, patch trading, sporting events, shows, ceremonial evaluations, American Indian activities, exhibits and displays, and a campus-wide game called “Seek” that used electronic armbands to link up with other participants and check in to sites and events, all of which earned points in the game. Both Pre-Ordeal ceremonial teams that represented the lodge gave outstanding presentations. Members of one team earned an Honor medal and members of the other team became one of only three teams nationwide to achieve Exemplar Gold status. Riley Millward also received an Honor medal for the Vigil ceremony. Teresa Bystrek won third place in the Women’s 5k race, and in the true spirit of brotherhood, Chaz Nickens joined brothers from a Georgia lodge and helped them win the Ultimate Frisbee championship. A number of Tutelo Arrowmen participated in other events such as the Spartan Race, a 1.5-mile course dotted with obstacles ranging from 4-6 ft. walls to 200-pound log rolls. Also, Erik Covington placed in the top 25 for Northern Traditional Dance. NOAC is always an exciting and inspirational event that gets lodge members charged up for the work ahead at our local lodge and camps. Don’t be surprised if you see contingent members bringing in new ideas or acting with a renewed sense of purpose. The next NOAC will be in 2020 at Michigan State University!